The Twelfth Judicial District Commission on Judicial Performance recommends, by a vote of 8-0 with two commissioners recusing themselves, that Judge Daniel Austin Walzl BE RETAINED. 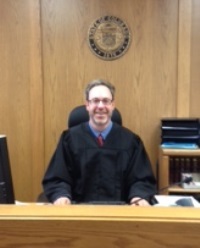 Judge Walzl was appointed to the Alamosa County Court in November of 2011. Prior to his appointment, Judge Walzl was the Deputy State Public Defender for the 12th Judicial District, San Luis Valley Colorado. He had been with the Public Defender’s Office for ten years. Judge Walzl received his undergraduate degree from the University of Virginia and, in 1999, his law degree from the University of Colorado School of Law. In order to form its recommendation, the Commission conducted a personal interview with Judge Walzl, observed him in court on various occasions, and reviewed surveys concerning various aspects of his performance as a judge from both attorneys (sample size of 43) and non-attorneys (sample size of 175) who had appeared before him or served on a jury in a case over which he presided. The final question on the survey was whether or not the respondent would recommend the judge be retained. The survey results were broken down between attorneys and non-attorneys, with 69% of attorneys recommending he be retained, 14% recommending he not be retained, and 17% making no recommendation. Among non-attorney respondents to the survey, 81% recommended he be retained, 9% recommended he not be retained, and 10% made no recommendation. Commissioners also reviewed the self assessment report completed by Judge Walzl. As a County Court judge, Judge Walzl presides over non-felony criminal cases, civil cases under $15,000, traffic cases, and small claims cases. Survey results showed him receiving an overall average rating slightly below that of county judges statewide among both attorneys and non-attorneys. Judge Walzl received high marks from attorneys responding to the survey for his diligence in being prepared for cases and his consistency in issuing consistent sentences in criminal cases where circumstances are similar. Judge Walzl has been described to be short-tempered with those appearing before him at times, but overall is considered fair and impartial.